There are nearly 5.5 million car accidents in the US each year, with about one in three resulting in injuries to the drivers, occupants or pedestrians. If you are involved in a Boston car accident, or anywhere else, it is in your best interests to be prepared by having a first aid kit, flashlight and camera, or at least one that is on your cell phone, in your vehicle. See if anyone has been injured, including yourself. If you feel injured, stay in your vehicle and await medical assistance or call 911 if you can. If others are injured, do not move them but call for help. Remain at the scene. It is unlawful to leave the scene of a property or injury accident without exchanging information with other involved properties. In some cases, the responsible driver will flee the scene but attempting to follow the car can lead to an increased risk of another accident or a violent confrontation with the other driver. Call police to report the accident and give a description of the car and license plate if you did notice it. Police also need to view the scene of the accident to properly investigate it so do not move your car if there has been an injury. For property damage accidents, safely move your car out of the path of traffic but note the position of the cars before they are moved. Exchange information. You are required to exchange information regarding your driver’s license, registration, and insurance. Do not exchange social security numbers. Make sure that you see the information and do not rely on the other party reading it to you. If the other party is unable or unwilling to exchange this information, call the police even if it is only a property damage accident. Take photographs. 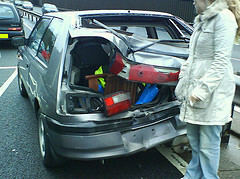 Nearly all cell phones have cameras, so take photos of the damage to the vehicles and of the accident scene itself. Write down the time of the accident, traffic and weather conditions, how many cars were involved, the position of the cars, if a traffic light or sign was involved, and if a flaw in a car or in the roadway itself may have been a factor. Take as many photographs of the accident scene as you can and then compile it into a digital disc for easy access. Get names of witnesses. Other drivers or passersby may rush to the scene to offer assistance. Obtain their names and contact information so that your insurer or police can interview them regarding liability, traffic and road conditions, the demeanor of the drivers involved or injured parties, and other vital information essential to a thorough investigation. Do not discuss fault or liability. Even if you feel you may have caused the accident, you likely do not know all the facts of what occurred such as if the other driver was speeding, was impaired or if an equipment flaw or something about the roadway was a causation factor. Tell the police what you know about your speed, position of your car and that of the other car, and whatever else you observed in the seconds before the accident. Do not refuse medical attention. In the aftermath of an accident, many people feel dazed, confused, or in mild shock. This can mask an underlying head or other injury that may not manifest symptoms for several hours or days. If police ask if you are injured, you can say you are unsure but allow medical personnel to examine you for signs of an injury. If you refuse medical attention but later begin experiencing symptoms, a defense attorney working for the insurance company will allege that you were not injured, are only claiming injuries to collect compensation or that any injuries you claim were not caused by this accident. Promptly follow up with your own doctor if you do not receive medical attention at the scene if you feel any dizziness, nausea, confusion or back or neck pain. Call a car accident lawyer. Many people attempt to handle their own accident claim and will settle with an insurer on their own, thinking that they are saving legal fees. In fact, studies show that injured victims who retain legal counsel recover far more in compensation for their claims, even taking legal fees into account. Your car accident lawyer can resolve insurance coverage issues, liability disputes and ensure that you receive proper medical care. To properly settle a claim, documentation is necessary to prove your damages, which may require reports from an accident reconstruction expert, documents proving medical expenses, medical and therapist reports addressing certain issues and employment or school attendance verification. Lawyers from the Law Offices Burns & Jain have been successfully prosecuting Boston car accident injury claims since 1985. Call our offices today for a free assessment of your car accident claim. We take car accident injury cases on a contingency basis so that we only collect our fees if you collect compensation for your injuries.